If you haven’t been to Trinidad and Tobago, you’re missing out on a country that combines many of the best qualities of the Caribbean and South America. One attribute endowed in T&T by its geological parent Venezuela is a deep diversity of avifauna, including a lot of South American specialties. So it should come as no surprise that Southern Lapwings abound there. 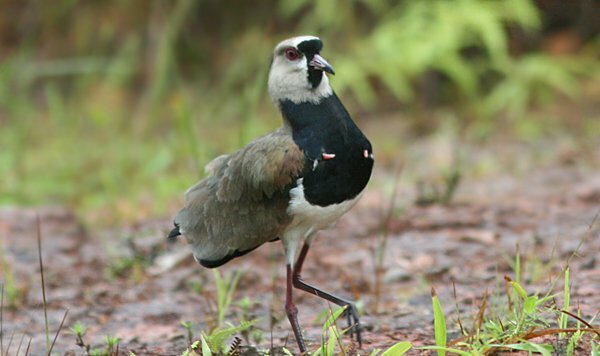 The Southern Lapwing (Vanellus chilensis) is big, beefy plover that thrives throughout South and even part of Central America. These beauties are boldly marked in gray, black, and white with iridescent flashes on their wings and seemingly glowing red eyes. Their eyes don’t actually glow, but do come off a little creepy. This effect is enhanced by the presence of wicked coral-colored carpal spurs. 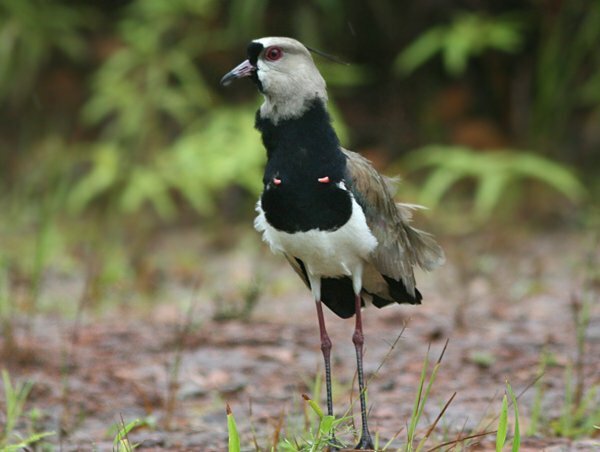 Most lapwings flaunt some ostentatious feature like a wattle, crest, or spur. The Southern Lapwing’s crest is evident, but I’d never noticed its spurs until a cocky male tried to intimidate my group in the Tobago Rainforest Preserve. There we were trying to lay eyes on crackers like Blue-backed Manakin and Yellow-legged Thrush (check and check) when one bird peeled off the flock and started flashing his weapons like a true gangster. Many lapwings have bony spurs at their carpal joints that are apparent when the birds fly. These barbs help fight off predators and competitors alike. Considering how deceptively large these waders can be, I suggest keeping a respectful distance! Cool bird Mike…I’m hoping to see them in Costa Rica this winter. Esta hermosa ave en Chile se le conoce con el nombre de Queltehue o Tero. Se alimentan de insectos que captura en pastizales y zonas cultivadas. Con su potente grito avisa ante cualquier situaciòn que lo asuste. Ambos sexos son iguales , forman pareja estable y sus huevos y polluelos se camuflan con el suelo. This beautiful bird in Chile is known by the name of Queltehue or Tero. They feed on insects caught in pasture and cultivated areas. With its powerful warning cry to any situation that scare you. Both sexes are equal, they form a stable partner and their eggs and chicks are camouflaged with the ground. Cool bird, I have seen it on the east slopes of Ecuador near Cabañas San Isidro. But I had no idea about those spurs! Those spurs are crazy looking. Thanks for sharing Mike! Maybe I’ll see one in Panama next week. Eva: How cool that you’re going to Panama. You’ll love it! You should find Southern Lapwings along the train tracks in Gamboa en route to Pipeline Road. otra ave que tambièn tiene espolones en sus alas es el Chajà ( Chauna torquata). estas aves poseen un doble espolòn en cada ala, no estàn emparentados con los Vanellus , pero comparten varias semejanzas en forma del cuerpo,ausencia de dimorfismo sexual. Estos Chajà estàn màs emparentados con los patos y gansos; aunque no poseen membrana interdigital ( natatoria ) , poseen un pico que recuerda a las gallinas y son del tamaño de un pavo. Habita al este de la Cordillera de los Andes, en Argentina y Paraguay.Emiten un grito muy sonoro y vuelan a una gran altura. Anidan en el suelo, en pastizales abiertos y se alimentan de pastos, semillas, moluscos e insectos. Son muy territoriales y usan sus grandes espolones para defenderse. Another bird that also has spurs on its wings is the Southern Screamer or Chaja (Chauna torquata). These birds have a double spur on each wing, are not related to the Lapwing, but share many similarities in body shape, absence of sexual dimorphism. These are more closely related to ducks and geese, but do not possess webbing (swimming), have a peak reminiscent of chickens and are the size of a turkey. Lives east of the Andes, in Argentina and Paraguay. Emits a very loud shout and can fly at high altitudes. They nest on the ground in open grassland and feed on grasses, seeds, molluscs and insects. They are very territorial and use their large spurs for defense. Francisco, thanks for the information. I look forward to seeing a Chaja some day. There is of course the Spur-winged Lapwing. Or try the Masked Lapwing at the link below. Here is a picture of a Blacksmith Lapwing with similar spurs. Your article is the only one I could find that mentions spurs like this on the chest. 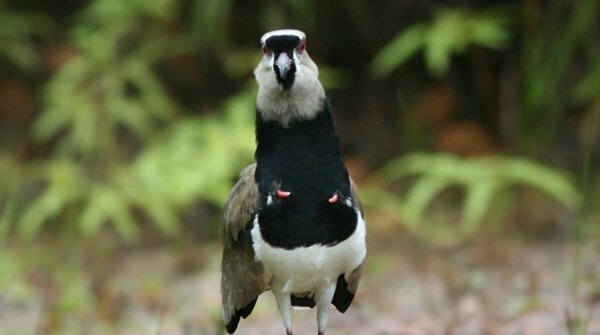 Have you ever heard of other lapwings with such spurs? Since I wrote my previous comment I have come to learn that the spurs are on the wrist of the bird’s wing, and they look as if they are coming out of the chest when the bird’s wing is folded against the body.